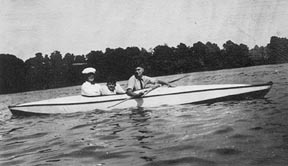 The kayak, as shown above, belonged to the Gladstone Cale family, who lived at the corner of 5th Street and Broadway. Ask the little guy in the middle how he enjoyed the ride. This experience led to the acquisition of a boat kit for the Wells family. The framework was prepared and then, for some unknown reason, the project was dropped. A number of years later, when I came across the resting framework which was hidden away in the space above the dining room, I saw the possibilities of great adventures. 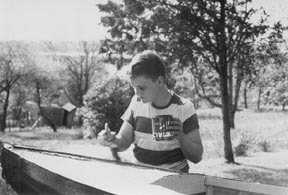 All of the decking needed to be replaced with marine plywood, but the aluminum and spruce ribs were in remarkable condition. I also found canvas to cover it with, and went to work. Well, the canvas had a seam down the keel and proved difficult to seal even with the best of pitch. Dad saw the dilemma and designed two galvanized sheet metal floatation compartments, (one for each end). The boat would be safe, even with the leaks. We were ready to conquer the Mississippi River and Cheney Creek. I purchased the double ended paddle and modified it to allow the unused end to feather when the other end was biting through the waves. 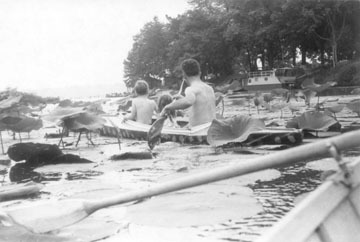 The kayak was still seaworthy in August of 1957, when one of the original builders, brother Jack took several of his kids for a ride through the lily pads in Lakeview Bay at the mouth of Cheney Creek.